The butterflies, and later the antelopes, conspired to break free of Tasha Lewis ’12’s mind and then out of Beardsley Hall. 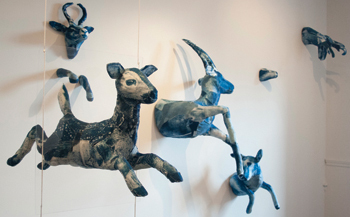 Her antelope sculptures breached walls at Hobbs Coffee in The Ville, then they galloped about in the College’s List Gallery before flocking to Old Tarble. From there, the majestic cyan herd pranced above gallery patrons’ heads in Philadelphia, then Indianapolis, jumping through walls and frolicking with a swarm of blue butterflies, a jaguar, birds, and foxes. 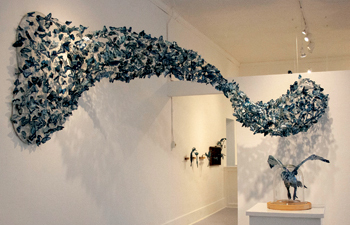 Two years later, these fabric-patchwork sculptures continue their whimsical migration for admirers around the country. They’re in so much demand that creator Lewis is able to work full time as an artist. But before their release into the world, Lewis’ first butterfly thoughts found physical form on the fourth floor of Beardsley. Other arts on campus were similarly marginalized. Music, though a part of the curriculum since the ’20s, did not see its first full-time faculty appointment until 1955 when Peter Gram Swing was hired to teach and make music. During the next decade, music became a formal major on campus, with the department expanding to three full-time professors. While music was the first of the arts to gain departmental status, it struggled to be seen as academically substantive. Course credit for what was called “creative arts,” as opposed to more theory-based arts studies, was a key challenge for all of the arts on campus until 1989. In 1970, the foundation of the theater department began when the English department dedicated a tenure line to theater and brought in retired theater professor Lee Devin. The classes, which focused mainly on acting, were also considered studio credits. As the music, dance, theater, and studio arts programs blossomed, with classes filling quickly, the cap on creative arts credits increasingly hindered comprehensive study. Finally, in fall 1989, the performing arts classes were freed from the five-credit rule—but not without acrimony. The move kicked off a new artistic era for the College, one that’s ongoing. In 1988, theater became a major, and in 1991 the program moved into the new Lang Performing Arts Center (LPAC). Though music, dance, theater, and studio arts attract more student practitioners than ever, nonmajors account for much of the participation. For instance, of the 60 or so members of the College orchestra, only about six are majors, says Thomas Whitman ’82, associate professor of music. But lack of majors does not mean lack of talent. Exon—who estimates his department graduates about 12 majors each year from the College’s overflowing studio art classes—finds that nonmajors and double majors contribute to the diversity that is the hallmark of liberal arts schools. Sharon Friedler, professor and director of the dance program since 1985, says that about 16 percent of the student body—approximately 250—enroll in dance classes every semester. Founding director Patricia Wityk Boyer, who arrived in 1968 when dance was still a part of phys ed, collaborated with Jim Freeman, Daniel Underhill Professor Emeritus of Music, so much, that in 1977 it seemed natural to embed the dance program within the music department. 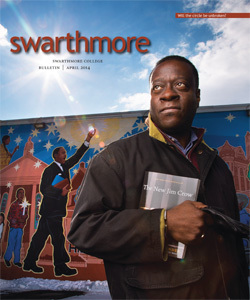 Current dance offerings—which now include more than 35 different classes in technique, composition, history, theory, and repertory—are strongly guided by Swarthmore’s principles. Meanwhile, working artist Lewis’ menagerie has continued to roam, stopping now to gambol through the commons of LaGuardia Community College in Queens. The sculptures, which draw fascinated and inspired onlookers daily, are the offspring of Swarthmore. Watch NYU Tisch School of the Arts Dean Mary Schmidt Campbell ’69 discuss her take on the role of the arts in the liberal arts here. See Lewis’ butterflies on campus here.